You are here: Home / VPN / VPN Master – MALWARE ALERT! The free VPN scam just keeps getting worse. Shady companies from all over the world are cashing in on the growing interest in online privacy by offering malicious free VPN services that steal user data. Unfortunately, many people fall for this scam because they don’t realize how dangerous these apps can be. One such example is VPN Master. 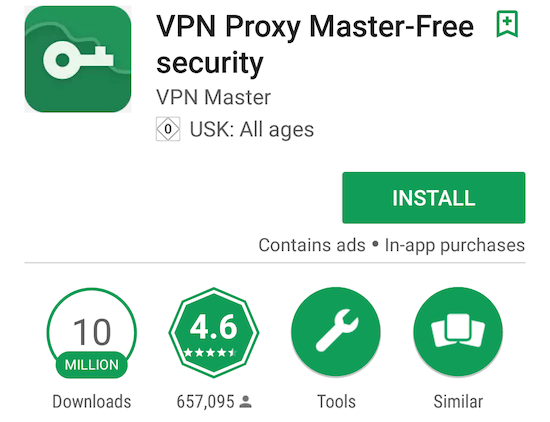 As you will see below, there are numerous free VPN apps using variations of the “VPN Master” name – and many of them contain malware (according to VirusTotal test results). They are used by many people (in some cases millions of downloads). They are full of malware. Now I’ll explain the testing procedures for these different “VPN Master” free VPN apps. There are many different types of malware (malicious software) found in free VPNs. Why is there malware in free VPNs you might ask? Well, malware is simply a tool for maliciously making money off the VPN user. Most malware found in VPNs is used to spy on users and record their data, which can be sold to third parties for lots of money. This should sound familiar, because it is the same business model used by Google, Facebook, and other companies offering “free” products. To test for malware with free VPNs, I use the online tool called VirusTotal. Malware is often designed to go undetected or circumvent malware scanning programs. 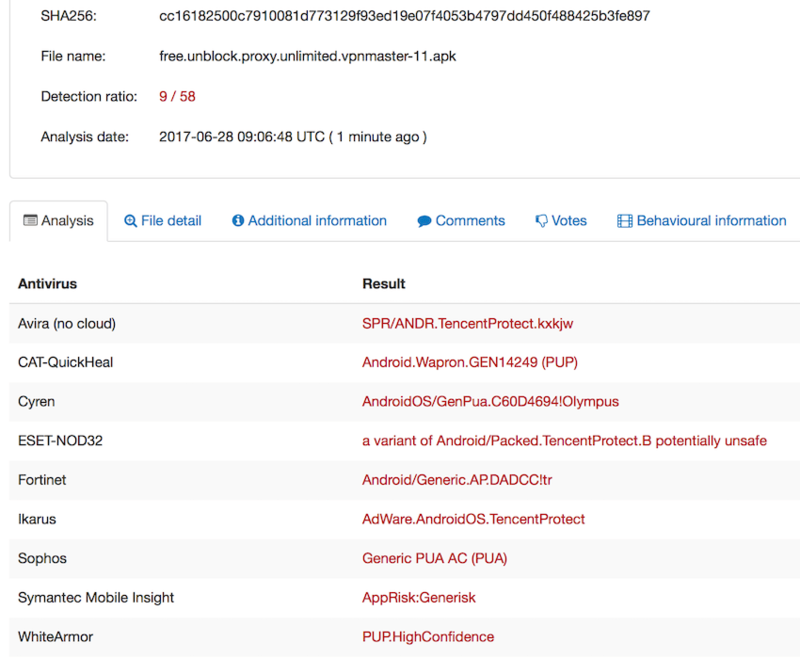 To address this problem, VirusTotal scans the file (free VPN download) using about 60 different antivirus tools. 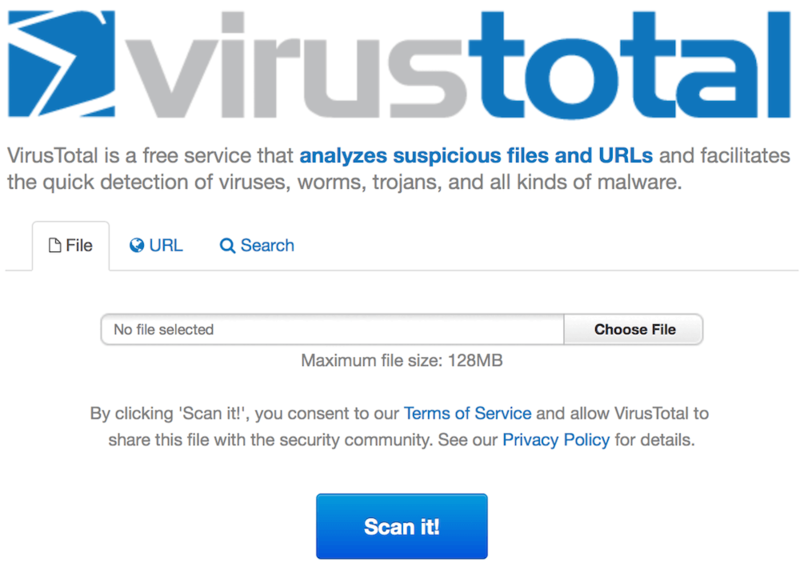 VirusTotal will tell you if your free VPN contains malware. But be careful when testing. I would not recommend downloading and testing free VPNs for malware. You could call this risky behavior. This is mainly because free VPNs are loaded with bad stuff that can infect your devices and go undetected by most malware programs. 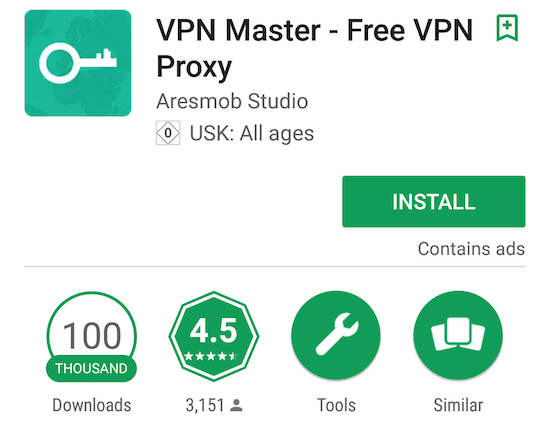 If you search for “VPN Master” in the Android store, you will find many different free VPNs with similar sounding names. Some of these VPN Master apps have millions of downloads and very high ratings. What the heck is going on with all these “VPN Master” apps? Data collection. 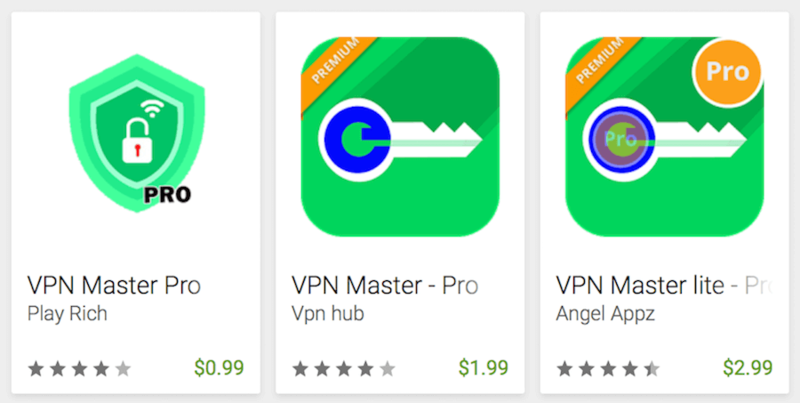 It’s quite interesting to see all the different versions of “VPN Master” you can find in the Google Play store. This definitely seems to be a growing trend – one that we have covered before in the VPN Warning List. 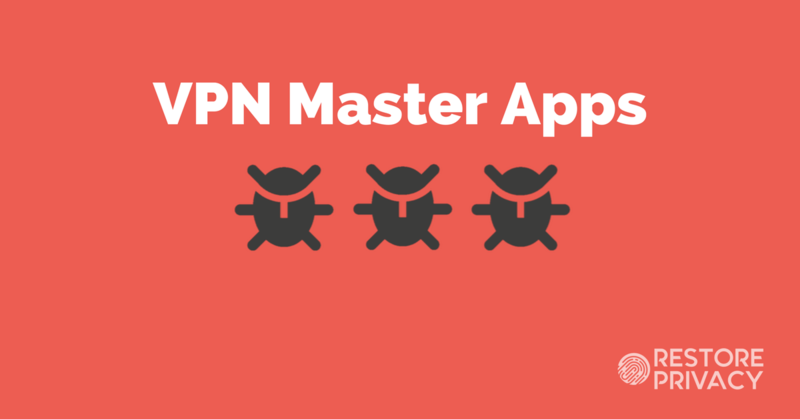 Below are the test results from examining four of the different “VPN Master” apps in the photo above. VPN Proxy Master is currently available in the Google Play store as a free Android app. The full name is currently VPN Proxy Master Free Security, which you can see below, along with the app details. Impressively, it has 10 million downloads and a 4.6 rating. 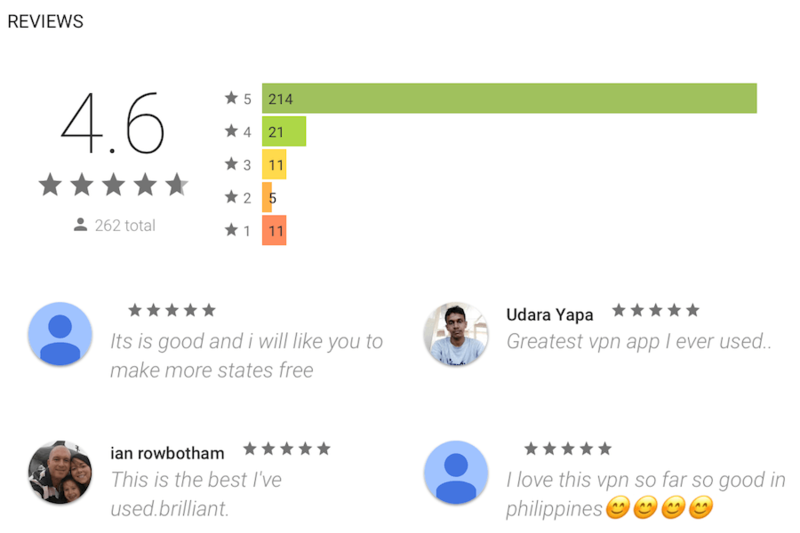 This makes it the most popular among the different free Android VPN apps tested for this article. 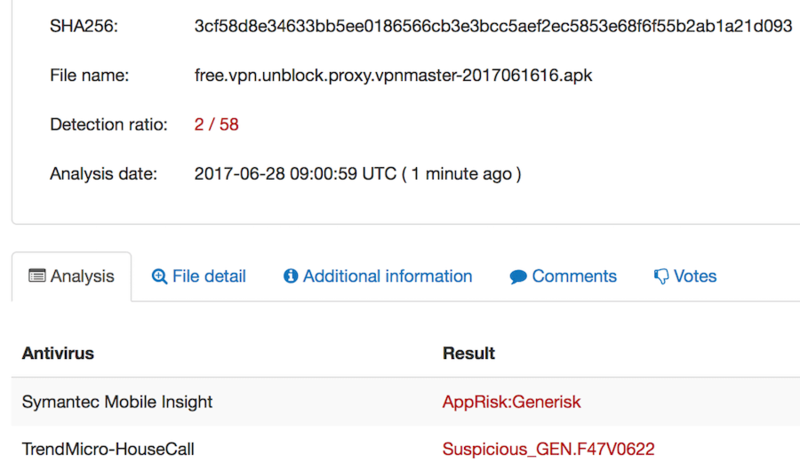 VPN Proxy Master tested positive for malware by two different antivirus programs when analyzed by VirusTotal. Finally, I also tested an older version of VPN Proxy Master for the Free VPN guide, and it had four positive hits for malware. 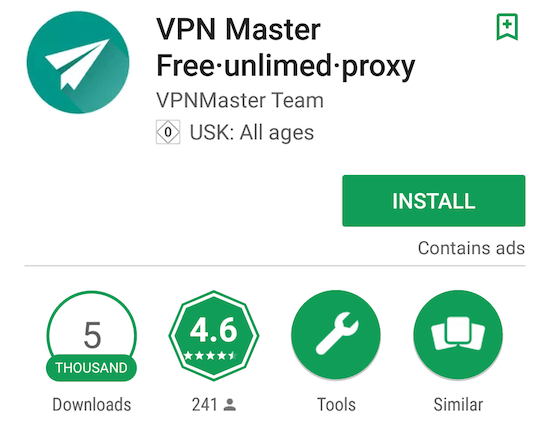 Another variation of the VPN Master app we find is called VPN Master – Free VPN Proxy in the Google Play store. Again, this is a free VPN Android app that is available for download. While it does not have as many downloads as the previous app, 100,000 is still a respectable number, along with a 4.5 rating. Unfortunately, VPN Master – Free VPN Proxy had eight positive hits for malware, when tested by VirusTotal. 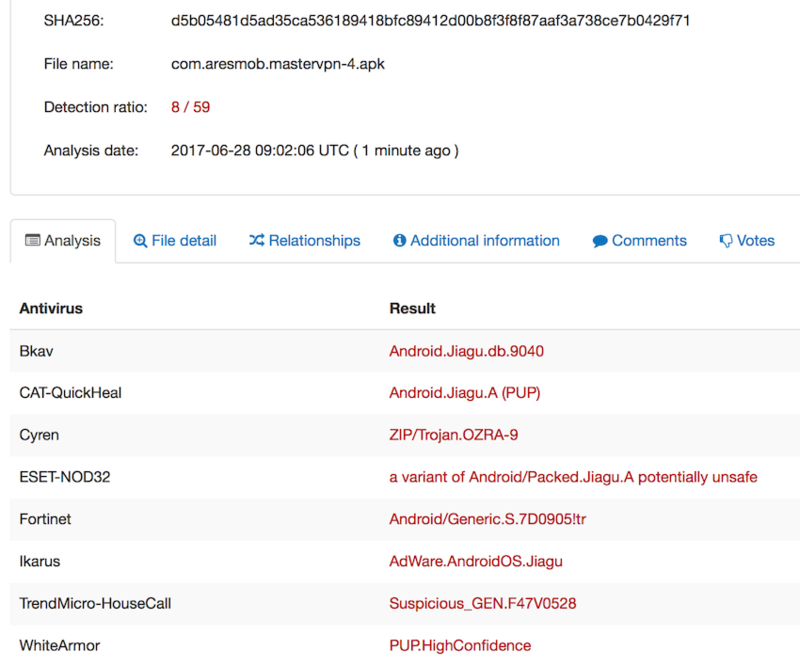 This is a huge malware presence and it is clearly a serious danger to anyone using the app, based on these tests results. This free VPN has a very large selection of malware. Just because an app is in the Google Play store does not mean it is safe. Here we have another variation called VPN Master Lite Unlock proxy, which is offered by Angel Appz. This free VPN has 100,000 downloads and a high 4.7 rating. Angel Appz is apparently based out of Tamil Nadu, India – according to the Google Play store. It had two positive malware test results. Looking at the test results, it appears that VPN Master Lite contains adware, which generates advertisements for revenue. According to VirusTotal, this free VPN app is not safe and should be avoided. Although it has less malware than others, any positive malware test is a very bad sign – especially for a product that is promising to offer privacy and security. Here we have another version that is called VPN Master Free unlimed proxy (sic). As you can see with the misspelling of “unlimited”, the developer either has very poor attention to detail, or is not a native English speaker – most likely both. The developer appears to be from China. The screenshot below comes from the Google Play store. It does not have as many downloads, but it has a good 4.6 rating. Now for the malware testing results. This one had more malware than any other of the free VPNs tested, with nine positive hits. We clearly see that this is a dangerous and malicious free VPN app, based on these results from VirusTotal. You see, Free VPN Master unlimed proxy (sic) appears to be associated with TalkingData, which is “China’s largest independent Big Data service platform” – according to their website. And as you have seen on our web site that we are a Big Data company we don’t provide VPN service. But did provide App Data analysis service which is TalkingData App Data Analytics. By this service app developer can analysis how people use their apps. So I think there is some mistakes in this situation. I think it just the app developer use our services to analysis their app’s user behavior and we don’t collect anything that is privacy. Otherwise developer couldn’t publish their app on Google Play or App Store. One recurrent theme you find on Restore Privacy is that many of the most highly rated VPNs (both free and paid) do not offer adequate protection. There are many examples of large, respected tech blogs promoting shady VPN services. 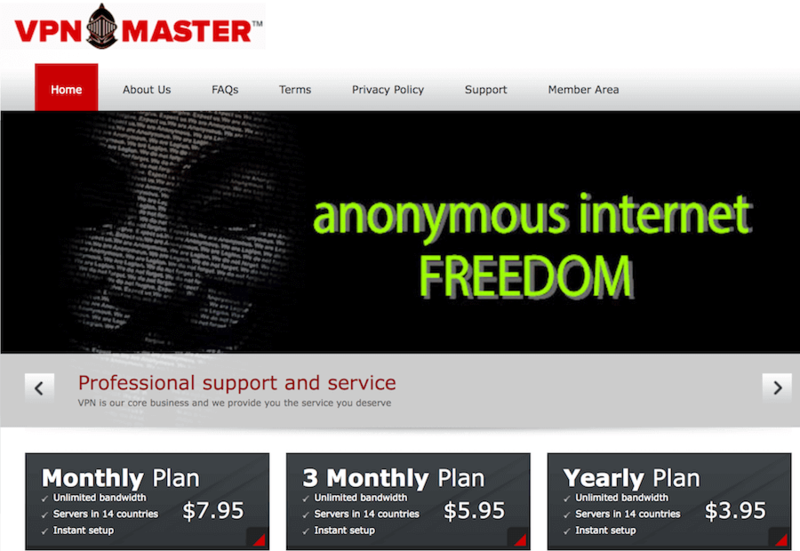 There also different paid versions with the name VPN Master Pro. I did not bother testing any of the “pro” or “premium” versions of VPN Master for this article. That’s because I did not want to flush my money down the toilet just to obtain the VPN Master APK file for testing. I did not test any of these VPN Master Pro apps, but I would NOT expect them to be much safer than the free versions. Free VPN Android apps are never a good idea. 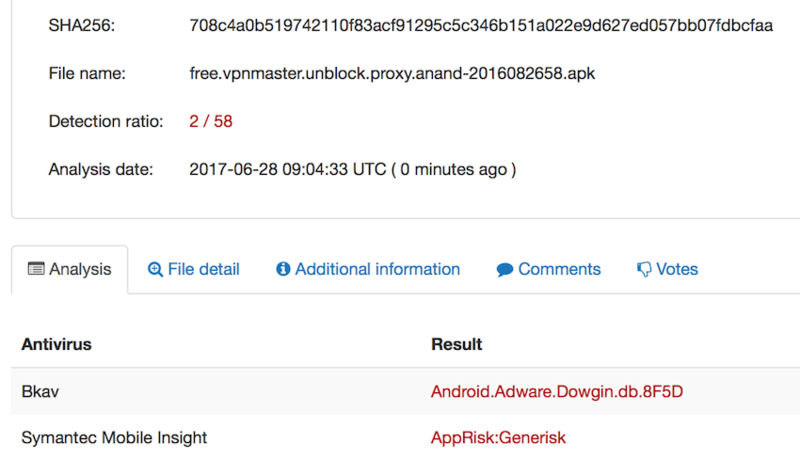 All of the VPN Master Android apps I tested were found to contain malware when tested by VirusTotal. There is no point in testing all of them – you can clearly see the trend. Trusting any free product to keep you safe is generally a recipe for problems. If you are looking to secure your Android and protect your privacy, I would suggest reading this Android privacy guide instead of using any of these shady free VPN apps. Just like with Android, there are many different versions of VPN Master available for iOS devices. Here is a quick screenshot from the Apple Store, which shows some of the different variations of the “VPN Master” name. Just like with Android, you can find many different versions of VPN Master in the Apple store for iOS devices. Extracting and testing iOS apps for malware and other threats is a bit more complex than with Android. There are also fewer iOS users than there are Android users. Therefore, for simplicity and to cover the widest audience, I mainly focused on the VPN Master apps for Android. Nonetheless, I would suspect these VPN Master iOS apps have similar problems. Once again, never trust your privacy with a free VPN app, whether it is with Android or iOS. The final item we will examine now is VPN Master for PC. If you look for the PC version of VPN Master you will come across a company that appears to be operated out of the United States (vpnmaster.com). Here is their website. This VPN looks somewhat legitimate at first glance. According to the About Us page, it has been around since 2008. To determine the how VPNMaster.com is related to the various VPN Master apps from above, I initiated a chat session. The chat representative told me that I could download their free version for Android in the Google Play store, and also provided me with a link. The link provided by the chat rep takes me back to VPN Master Proxy in the Google Play store. This was the first app I tested above and confirmed the relationship between vpnmaster.com and their Android app. Just to be clear, I did not test the paid version of “VPN Master” above (from vpnmaster.com). It may or may not be safe to use. Nonetheless, given these results, I do not recommend using any VPN Master app whatsoever. Once again we see that free VPNs are a disaster when it comes to protecting your privacy and securing your devices. If you are looking for a secure, safe VPN I would recommend going with a paid version – see my best VPN recommendations for more details. As the saying goes, if something is free then you are the product. All of the different VPN Master apps show us once again that this saying is true. Nice to meet you. I am working for TalkingData which you mentioned in this article. And as you have seen on our web site that we are a Big Data company we don’t provide VPN service. But did provide App Data analysis service which is TalkingData App Data Analytics. By this service app developer can analysis how people use their apps. So I think there is some mistakes in this situation. I think it just the app developer use our services to analysis their app’s user behavior and we don’t collect anything that is privacy. Otherwise developer couldn’t publish their app on Google Play or App Store. Er det bare å slette appen og du er ikke i “faresonen” med tanke på virus osv.? Evt. Hva skal man gjøre for å bli kvitt dette? 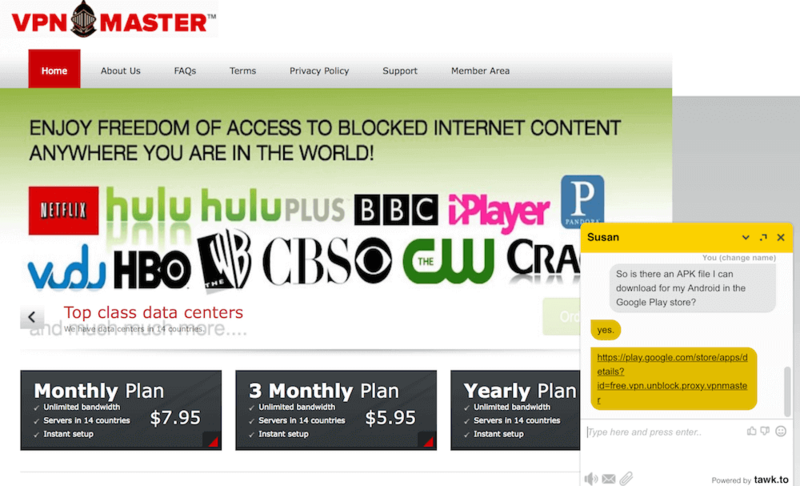 Hi Sven, what about Proxy Master which gives free VPN service. I do not know about Proxy Master, but it appears to offer the exact same business model we see here: offer a free product for malicious data collection. Again, when something is free, then you are probably the product. Recently I’ve received on my iPhone a warning message claiming that I have viruses, and offering cleaning up and protection help, and in particular, as a the first step it suggests to instal “Best VPN proxy better net” app. To me, it sounded too fishy! So I’ve decided to ignore that message. Do you think I am right or wrong? In general, is there any way to filter out decent VPN applications from the malware ones? Hi Anatoly, yes definitely sounds malicious. Basically all free VPNs should be avoided – see the free VPNs guide for more info. 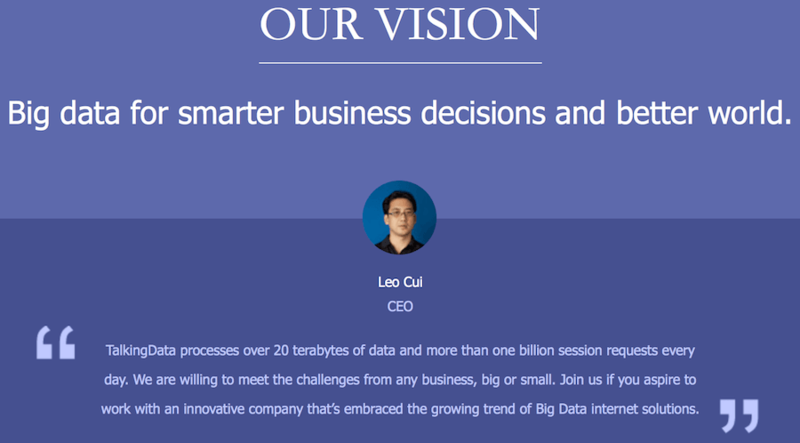 They monetize the service by collecting and selling user data (just like Google). Check out the Best VPNs list for the top recommendations. Also note – just because an app is in the Apple store or Google Play store does not mean that it is safe to use. Hi Jim, I have not come across anything too alarming with TunnelBear. I intend to review them in the coming months. They basically use the free sample business model. They give you a little bit for free, in the hopes that you buy the premium package.